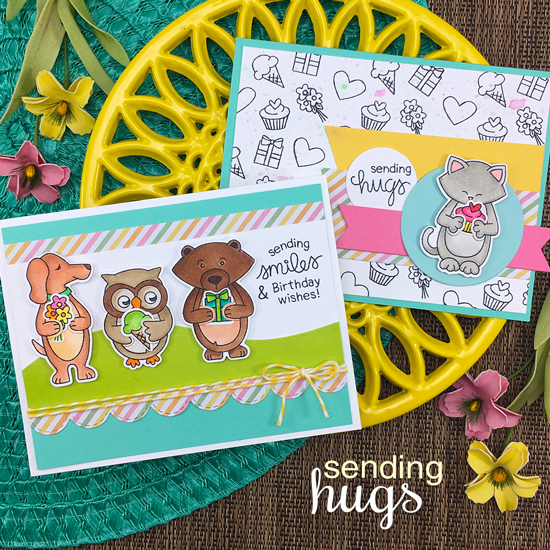 Today is the our second reveal day for our January Release and we are featuring adorable new critters that hug in our Sending Hugs Stamp Set and Coordinating Die Set. We are giving the Sending Hugs stamp set away one lucky winner so make sure you read all the way to the bottom of this post to see how to win! 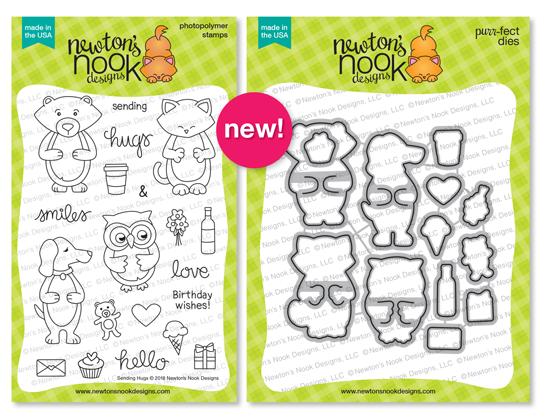 Join Newton and his friends and send a hug to someone you know with this sweet 4x6 stamp set. This set features four adorable critters with their arms ready to hug all the included accessories! Use the coffee mug for a warm "Hello" or the little gift for a birthday card! The possibilities are endless. You'll want to check out the coordinating die set too, which includes an interior cut for the arms so items can easily be inserted between them. Get inspired to send hugs with these adorable projects by our Design Team! This card by Naki is so adorable! She used the heart from the coordinating die set to create a little heart banner that both the pup and bear can hold! She also used the new Tumbling Hearts Stencil to create the background! 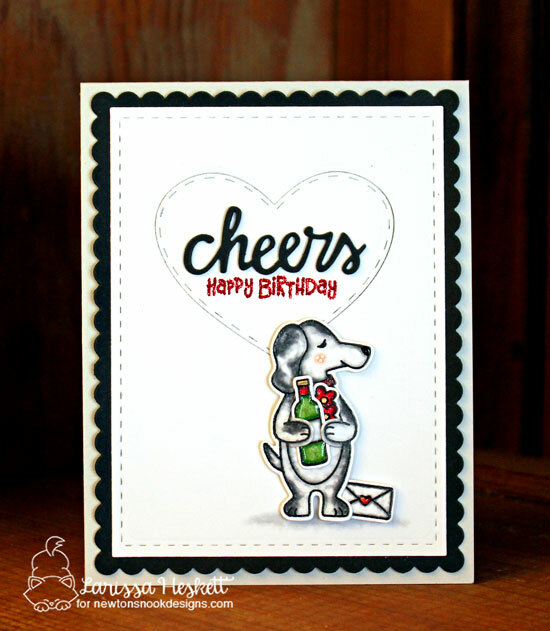 Larissa created an adorable Birthday card using the dog holding a bottle of wine and flowers from the Sending Hugs Stamp Set. She also added the "Cheers" die cut and Happy Birthday sentiment from the Cocktail Mixer Stamp & Die Set. She also used the scallop edge frame from the Frames & Flags Die Set. Juliana created this super cute card with a whole crew of friends inside a polaroid frame! Those critters are so cute hugging their gifts and cupcakes! What a great way to send a birthday wish! This sweet birthday card was created by Maria. She used the kitty colored in grey and added a cute pink cupcake inside the kitties paws! She also added on the "happy birthday" sentiment from the Newton Loves Cake Stamp Set. Samantha created this adorable card using the owl from the Sending Hugs Stamp Set. She added a cup of coffee in his wings to keep him warm! She also added in a branch from the What a Hoot Stamp Set. For the background she created clouds using ink with a mask created from the the Sky Borders Die Set. 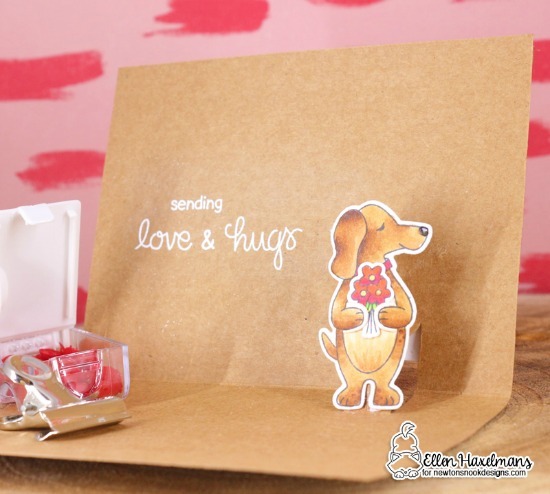 Ellen created this adorable pop up card using the dog from the Sending Hugs Stamp Set. It's so cute how he pops up holding that bouquet of flowers! The trio of friends on this card by Tatiana is ready to send birthday wishes! She colored three of the critters from the Sending Hugs Stamp Set and tucked in flowers, a gift, and a cupcake into their arms! She used the Tumbling Hearts Stencil to create a fun heart background. She also used the Frames & Flags Die Set to cut out the framed edge and the cute little banners! The pink and purple owl on this card by Jennifer is so cute! It's so adorable how the owl is holding a love letter tucked into it's wing and ready to send love! She also used the Tumbling Hearts Stencil to create a fun heart background behind the owl! 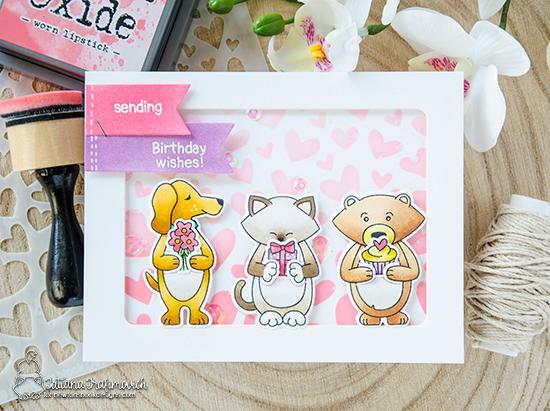 Holly created this adorable trio of birthday friends using the new Sending Hugs Stamp Set and adding cute birthday items inside their arms! She layered them over a gorgeous teal watercolored background. The scallop edged panel was trimmed out using our Frames & Flags Die Set. Really cute...love that the little hands cut out to hold things. Terrific idea. Cheers. This set is sooooo adorable! I'm really in love with the incredibly clever coordinating dies!!! And the design team did such a wonderful job! So much inspiration!!! Oh I love all the different options of this set! Super fun and cute! one of my favorite one! love how the dies work! I love it when you include a wiener dog in your sets! As a wiener dog mommy, they are always my favorites! This one is super cute, too!! Cuuuuuuuuuuuuuute! OMGoodness, the cuteness! This is a must-have set for me! Love, love, LOVE! Your cards are so cute, Jen, and I will definitely be hopping around on the blog hop to see all the cards! Such a fun stamp set! I love all the different objects they can hold in their hands. Thanks for all the wonderful inspiration. What an amazing release with such stunning samples. I keep adding to my wish list!!!! I just might have to get this stamp and die set; too cute! I went backwards on the blog hop. And it was such a treat. Loved every single one of the artists creations. And that died that is so clever. This is definitely going on my wishlist. Are you kidding me?!?!? I totally love that the die allows these sweeties to hold little pretties!! Each of these designs are great inspiration! Love these cute animals and how they can hold things. What adorable cards! Any set with Newton is awesome! Very fun with all the different props they can hold! I'm loving the sample shared today. That is such a clever die set. How adorable is this set! Love how the critters can hold things! I LOVE LOVE LOVE that you included a puppy in this set Jen - THANK YOU!! Love these cute critters with all their endless possibilities! These are ALL just DARLING! I love the heart chain!! What's not to like about putting cute little things in those adorable paws?!! Totally sweet set with all the critters and so many things to have them be holding!!! Newton is so cute in this stamp set!-Maria Giselle B. So many ideas... Love the cute critters and the accouterments!!! Absolutely cute!!! Love all these adorable cards!!! Eeeeek! So super cute! Brilliant arm die cut design. Love, love, love that! These are all great. I really love the Polaroid though. 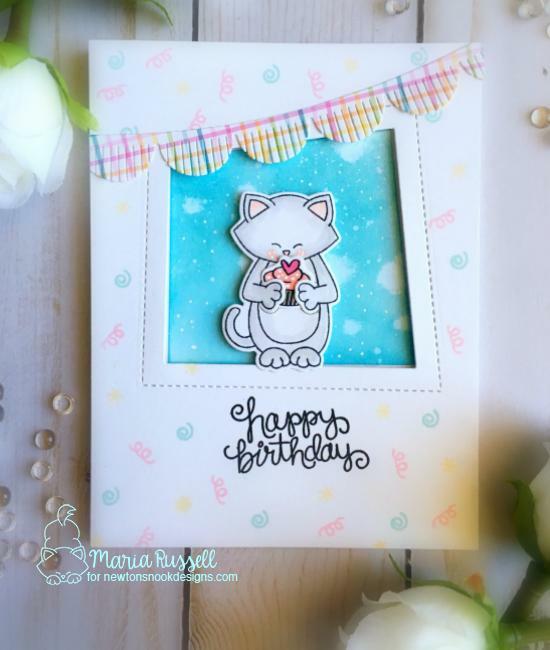 Beautiful cards made with the Sending Hugs Stamp Set and Coordinating Die Set. Great cards! Love all the creativity on this hop! Love how they all can hold little goodies! Fantastic stamp set! I love all the little accents the critters can hold! That’s a super adorable stamp set ! This is so smart! I love it!! Oh this set is so cute, I love how the critters can hold all the little add ons. So much you can do with it. The team created great examples! !